Word has reached the Central Texas Conference Service Center that many across the conference are wanting to know how they can help assist (beyond just continuing prayers and making donations to UMCOR) in the efforts to clean up after the wildfires that have ravaged the Central Texas communities in and around Bastrop, Texas. According to Rev. 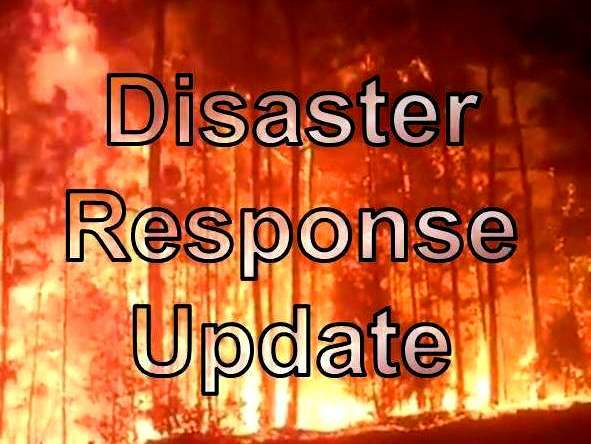 Laraine Waughtal, CTC disaster response coordinator and pastor at Bluff Dale & Morgan Mill UMC, currently only ERT-trained personnel are allowed into the work areas of the Bastrop fires at this time. The conditions are still very hazardous, and as such, they can only use those officially trained Early Response Teams. However, given the need for help, they will accept anyone who has been trained in ERT in the last five years instead of the standard three-year limit on training. If you meet these qualifications and would like to register to be part of the recovery efforts, you can register through the Southwest Texas Conference’s Disaster response page via the SWTX website. As a reminder, all teams need to be sure and do background checks and apply for UMVIM insurance. Please notify Kyland Dobbins or Laraine Waughtal if you are taking a team to this area. As soon as UMVIM (United Methodist Volunteers in Mission) teams are welcome to come into the area, we will pass this information along to the conference. We’ve also learned of another area of the country that is in desperate need of help and that would be our brothers and sisters in the Northeast region of the United States as they race old man winter in their efforts to cleanup following the record floods they experienced late this summer. If you would like more information about these efforts, please follow this link to read more from the United Methodist News Service.